Its important for a web designer that a website loads quickly. Every remember the 4 second rule for websites? If a website doesn't load (or nearly all of it) then a user leaves. Most of the load time depends on a server but a lot of it can be sped up by finding out what time it takes for things to load. To enable you to do this quickly and effectively, this tool pingdom, is perfect. What the tool does, is analyse the load times, from first connect to the last byte, of every element on your website. It the presents this in a a cool graphical manner for you to analyse and find out what is happening in terms of time. This tool is really great. For example from the above graph I can see that one element of my site is taking a really long time to load. This can then be debugged and changed in my code. A better example of this was the reddit widget on my site. 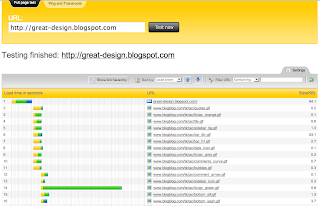 Before I found and used this tool, my site would take ages to load, over a couple of minutes. This code helped a lot. I would definitely check this site out. Its is a really good tool to have in your design arsenal. Pingdom.